Blue Heron was founded by Ron Strom and Maurice Malfatti in 2011 and is based in Raleigh, North Carolina. The Blue Heron team averages over 20 years of experience in portfolio and asset management, real estate investment, finance, development, construction and consulting. The team’s experience encompasses a broad range of property types, including multifamily, mixed-use, office and retail, and a track record that demonstrates a history of successfully investing in and operating across various economic cycles. The team’s diverse background, including those with deep local ties to the region and those who chose to relocate to the area, provides balanced perspective and best-in-class industry practices to make investments that protect and grow investors’ capital. Maurice co-founded Blue Heron in 2011. He oversees the firm’s operations and the investment strategy, portfolio construction, and management of Blue Heron’s funds, serving on the Investment Committee for each fund. Maurice plays a key role in sourcing opportunities and negotiating deal structure and terms. He is actively involved in the visioning and development of the value-creation business plan for each asset and the oversight of its execution. Maurice has 20 years of real estate experience, spanning investment, commercial brokerage, development, and construction, and during the recession, served as a key member of a distressed asset receivership team on behalf of a regional bank. Maurice began investing in real estate in 1996. As a commercial broker, from 2005-2011, Maurice successfully closed 85 lease and sale transactions, spanning office, retail, industrial, self-storage and land; and served as property and or asset manager for several retail, office, and residential rental properties. Over his career, Maurice has co-founded, operated, and profitably exited several ventures, including real estate investments and a construction/property maintenance company. From 2000-2005, Maurice was a partner with a NYSE-member broker-dealer firm, covering buy-side institutional investors as an equities sales trader. He began his career as a systems analyst for Andersen Consulting (now Accenture). Maurice is a NC-licensed real estate broker and a past member of the Board of Directors for the Realtors Commercial Alliance in Wilmington, NC. As an active member of the Urban Land Institute, he serves on the “Rethinking Southern Cities” Regional Initiative Council. Maurice is an active supporter of Habitat for Humanity and a regular participant of CEO Build and Team Build events, and a frequent guest lecturer at the UNC Kenan Flagler School of Business. Maurice received a BS in Industrial Engineering from Lehigh University. Ron co-founded Blue Heron in 2011. He serves on the Investment Committee for each fund and works closely with Blue Heron’s partners and investment team to guide the execution of Blue Heron’s real estate investment strategy and the firm’s corporate strategy. Ron also helps to broaden and strengthen key relationships with investors, business partners, and other leaders in the real estate industry. Ron has over 36 years of experience spanning all phases of commercial real estate including development, acquisitions, dispositions, debt transactions, lease negotiation, asset management, advisory work, and brokerage. Prior to co-founding Blue Heron, Ron developed, acquired, and invested in multiple property types including residential, historic renovations, office, retail, land for development, student housing, and multifamily projects. He led the assemblage, development, and disposition of a portfolio of retail centers to a publicly traded REIT, the redevelopment and ground-up construction of two Whole Foods centers in North Carolina, and the development of four projects for the University of North Carolina at Chapel Hill. 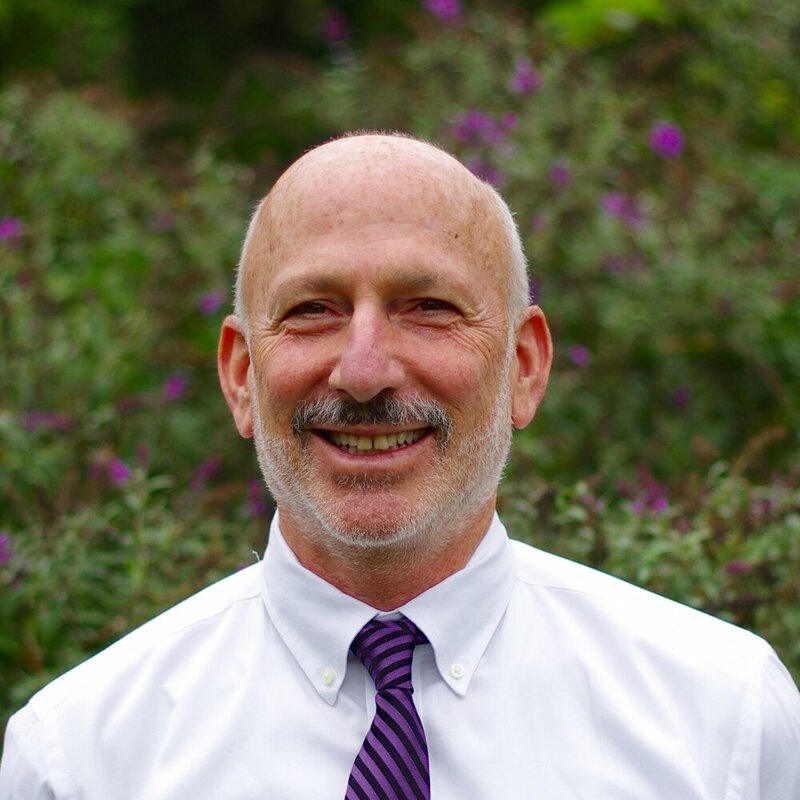 Ron has served as a real estate consultant to Whole Foods Market, UNC-Chapel Hill, and GlaxoSmithKline. Ron has and continues to serve on numerous boards and in leadership positions within the greater Triangle area of North Carolina. He chaired a $2M Capital Campaign for WUNC Public Radio and served as the Chairman of the Board for Triangle Land Conservancy. He serves on the Leadership Council of Triangle Community Foundation. He has served on the boards of UNC Board of Visitors, the Self Help Venture Fund, the Chapel Hill Public Library Foundation, and continues to assist local agencies with affordable housing initiatives. As part of Blue Heron's entitling of one of its Fund I assets, he authored Chapel Hill's first affordable housing rental agreement which became a finalist for Urban Land Institute's 'best ideas' in the Triangle for 2014. Ron received a BS in English and Education from Vassar College and a Master’s of Education from University of North Carolina at Chapel Hill. Michael joined Blue Heron in 2012, and in 2016, he became a partner of the firm. He serves a key role across the spectrum of investment, asset management, and development activities of the firm. Responsibilities include market research and analysis, originating, underwriting, and structuring new investment opportunities, capital markets activities, asset management, and development management. He has worked alongside the firm’s founding partners in establishing the framework for the platform and in continually optimizing systems and processes to reflect industry best practices. Since joining Blue Heron, Michael has led the acquisition and disposition of interests in investments with aggregate values of more than $400M. Michael has been involved in the underwriting and evaluation of more than 200 investment and/or development opportunities totaling more than $1.1Bn in potential capital investment. He has led the asset management for all Blue Heron’s multifamily properties and has overseen the financial and operational performance of more than 1,250 multifamily units across six properties with aggregate values of more than $225M. Michael received a BA in Economics from University of North Carolina at Chapel Hill and an MBA from the University of South Carolina. Before joining Blue Heron, Benjamin was a managing principal at Hampstead West Holdings (HWH), a boutique real estate investment, development and advisory firm focused on urban-infill redevelopment and value-add opportunities. Prior to HWH, Benjamin worked in acquisitions and development at Sares Regis Group of Northern California where he was responsible for acquisitions, capital relationships, design and entitlements, construction oversight, financing, and project operations for residential, mixed-use and public/private partnership projects. Benjamin began his career at private equity investor and developer, The JBG Companies in Washington DC (now JBG SMITH), where he focused on the investment in and development of urban-infill, smart-growth and adaptive-re-use of residential and commercial real estate and where he became JBG's first LEED-Accredited Professional. Melissa joined Blue Heron in 2016 to lead business development, investor relations and communications, to collaborate on procurement of debt and equity for investments, broaden capital markets relationships, source investment opportunities through a broad network of relationships, and to participate in other senior-level business functions. Melissa has over 20 years of experience with large financial institutions advising on direct real estate investments for high-net-worth families as well as commercial real estate underwriting, macro-economic analysis, finance, capital markets, business development and relationship management. Prior to joining Blue Heron, Melissa was Senior Vice President and Relationship Manager for Wells Fargo's Private Bank in Chapel Hill, NC. Melissa was responsible for advising high-net-worth families on investment asset allocation, real estate, trust and estate planning, and risk management. She oversaw and partnered on over $1B dollars of assets under management and over $300M of real estate acquisitions, dispositions, and debt transactions for private bank families. While at Wells Fargo, she also served as Market President for Chapel Hill and was responsible for business development for the bank in the local community, working closely with commercial brokers, attorneys, CPAs, and business leaders. Melissa has served the Chapel Hill Public School Foundation for seven years, including chairing the development committee for fundraising and strategic planning and leading the investment committee. She has worked with Dress for Success, Habitat for Humanity, United Arts, and United Way, and spearheaded Excellence in Education, a program teaching financial literacy to fourth graders. Melissa received a BS in Business Administration from the University of North Carolina at Chapel Hill's Kenan-Flagler Business School. Deborah joined Blue Heron in 2016 as Chief Financial Officer. Deborah directs all aspects of finance for Blue Heron including financial reporting, fund administration, fund metrics reporting, annual audits and tax preparation, budgeting, and cash flow projections. She works closely with the Blue Heron’s asset management and development teams to analyze budgets and cash flow of the investment properties. Deborah has been engaged in the practice of accounting for over 28 years, beginning her career with KPMG auditing banks, insurance companies, and other heavily-regulated industries. Her career includes diversified financial management positions in a variety of industries including real estate investment, operations, and development, life, health, property, and casualty insurance, and pharmaceutical product development and distribution. Previously, she served as Vice President of Financial Development for Universal American, Director of Finance for Lek Pharmaceuticals, and, most recently as Chief Financial Officer for The Martin Organization, a real estate conglomerate with development, commercial, and residential holdings as well as self-storage facility development and management. Deborah has held treasury and other positions on several non-profit Boards including Cape Fear Literacy Council, Wilmington Child Advocacy Commission, and The Penn State Alumni Association of Wilmington NC. Deborah received a BS in Accounting from The Pennsylvania State University and an MA from University of North Carolina at Wilmington. She earned the CPA designation in 1993. Matt joined Blue Heron in 2014 and has over 15 years of real estate experience in acquisitions, dispositions, financial analysis development, renovation, leasing, property management, and historic restoration. His main areas of focus for Blue Heron include asset management, acquisitions, and firm compliance. Prior to joining Blue Heron, Matt managed finance, leasing, and property management for NC-based retail developer Adventure Development. He played an instrumental role in the development of a $100M+, 1.2M-square-foot mixed-use project in Pittsburgh, PA. From 2004-2010 at Mark Properties, Inc., a private equity real estate investment company in Durham, NC, Matt led acquisitions, asset management, and leasing of a 2.5 million-square-foot retail and office portfolio. Ahead of the Great Recession, Matt participated in the disposition of much of Mark Properties’ holding, including the successful marketing and sale of a portfolio of shopping centers. Matt is a board member and executive committee member of the Self-Help Venture Fund in Durham, NC. As an active preservationist, Matt received the Carraway Merit Award from Preservation North Carolina in 2017. He volunteers with the Princeton Alumni Schools Committee and has served on the advisory board for the Museum of Early Southern Decorative Arts in Winston-Salem, NC. He is a licensed real estate broker in North Carolina. Matt received a BSE in Mechanical Engineering from Princeton University, an MA in Early American Culture from the University of Delaware/Winterthur Museum, and an MBA from Duke University’s Fuqua School of Business. Kevin joined Blue Heron in 2017 and serves as a member of the investment team, supporting investment, asset management, and development activities. His responsibilities include development project management, acquisitions underwriting and analysis, asset management, market research, and data analytics. Before joining Blue Heron, Kevin spent 6 years as an architect in a wide range of roles including design, project management, and construction administration. He worked in various markets and across many building types including large public projects, commercial office, multifamily and student housing, and custom single-family homes, as well as several historic and adaptive reuse projects. While pursuing his MBA, Kevin managed Kenan-Flagler Business School’s real estate private equity fund, overseeing three fund vehicles. In this role he was responsible for fundraising, deal sourcing, investment underwriting and execution, investor relations, and asset management. He also oversaw accounting for the fund including capital calls, distributions, and financial projections. Kevin is a registered architect in North Carolina and a LEED Green Associate. He received a BS in Architecture from North Carolina State University and an MBA with a concentration in real estate from the University of North Carolina at Chapel Hill's Kenan-Flagler Business School. Missy joined Blue Heron at its inception in 2011 and has worked alongside co-founder Ron Strom for over 30 years. She provides support across numerous areas of the firm, including investor relations, project management and financial reporting, and manages office operations tasks. Missy has over 30 years of experience in commercial real estate, including lender and investor correspondence, development and project management, real estate closings, and property management. While with Blue Heron, Missy has fulfilled bookkeeping and accounting duties across all assets and has served in a project management capacity for over $100M of real estate development and renovation projects. Missy works closely with Blue Heron’s CFO, external auditors, and fund administrator in the preparation and distribution of investor reports and financial statements. She assists Blue Heron’s legal counsel in both fund and real estate closings and works closely with lenders, property managers, and internal asset and development managers throughout an investment’s life cycle. Prior to Blue Heron, Missy worked with Ron Strom performing project management duties across numerous developments including UNC’s student housing development, three office buildings for UNC-Chapel Hill, the renovation of Midtown Market shopping center in Chapel Hill, NC, and the development of several Whole Foods stores. Missy received a BA in Communication from University of North Carolina at Chapel Hill.